Sony has announced two new low-end devices, mainly focused on emerging markets but also can have their place in the European markets. Xperia T2 Ultra. This device is a 6-inch phablet with a medium resolution Triluminous screen (720 x 1280 pixels). It has a quad-core Snapdragon 400 processor with 1 GB of RAM and 8 GB of internal memory, expandable with an SD card. It includes a 3000 mAh battery and NFC and LTE connectivity. The Xperia T2 Ultra works with Android 4.3 Jelly Bean and will be available in three colors: black, white and purple. It has a pretty good 13 MP rear camera and a simple 1.1 MP front one. Sony takes advantage of good image quality and includes plenty of apps to get the most out of their cameras. The Xperia T2 Ultra comes with Portrait Retouch, Collage, Background defocus, Timeshift burst, and Sweep Panorama, in what the company defines as smart social camera system. Xperia E1. This device is designed to cover the low-end market of Sony Xperia. It features a 4-inch WVGA low resolution screen (800×480 pixels), a quad -core Snapdragon 200 and 512 MB of RAM. It has 4 GB of internal memory, a 3 MP rear camera and works with a 1700 mAh battery. It runs Android 4.4 KitKat to get the most out of the RAM available and offers some remarkable features in music reproduction, like the sound system xLOUD and ClearAudio+. 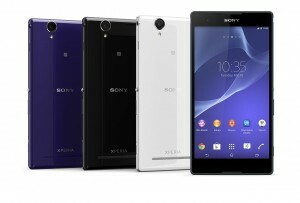 The Xperia T2 Ultra and the Xperia E1 will be available this spring in the European markets.